I’m ready. I’m ready for the transition. I’m ready to “cross over,” if you will. Not Medium or Ghost Whisperer style, just seasonal. The school bell is ringing for some local students here already and sweaters are starting to appear in the clothing stores. I know it’s still August and hot weather isn’t completely over yet, but I’m ready for fall, which is definitely my favorite time of the year. 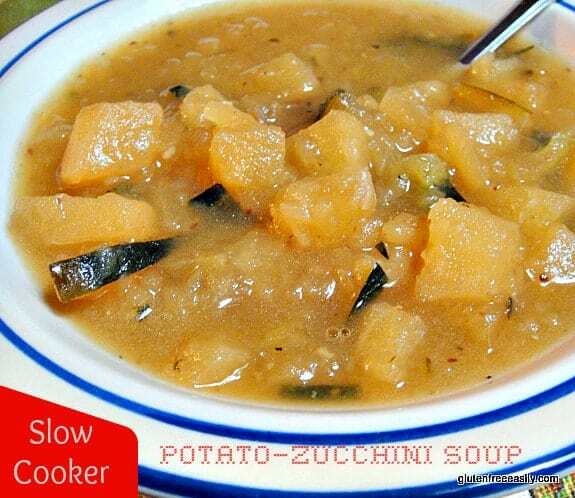 And, a definite fall thing for me is soup, like this Easy Slow Cooker Potato-Zucchini Soup. We had one day last week that was rainy and cool enough for me to make Tortilla Soup (with chicken, corn, and black-eyed peas this time—a little Southern touch with the latter) and the next few days are supposed to only be in the 70s. I’m headed to Seattle for the International Food Bloggers Conference where it’s even cooler—mostly 60s during the day and 50s at night. Oh, my, what an event the IFBC is going to be! 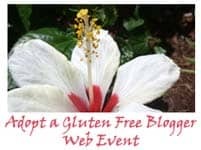 Diane has outlined what we, the gluten-free bloggers, will be doing at IFBC and in Seattle, here. Just reading her post made me get more excited … and a little panicky realizing how much I need to do before I leave. So, yes, a little warming, soothing soup is in order. A while back Dr. Rodney Ford, one of our world’s gluten-free experts who I greatly admire for so many reasons (more on Dr. Ford in a moment), shared a link on his main Facebook page to a cookbook and website called 4 Ingredients. Well, remember the “easily” part of gfe … I really liked that concept. Recipes with four ingredients would inherently be easy. I have a bunch of four-ingredient (or less) recipes here on gfe, but I’m always looking for new ideas. So, I immediately checked out the site and signed up for the newsletter to get a feel for what was being offered. Personally, I’m a bit reluctant to order a cookbook without knowing more about it. The 4 Ingredients authors, Rachael Bermingham and Kim McCosker, live in Australia. Their cookbook is the number one bestselling cookbook there. The recipes aren’t all gluten free, but many are and others are easily adapted. Bermingham and McCosker have a few more cookbooks in development. I find that often recipes from another country are quite different from ones we’ve “grown up on” and can expand our horizons a bit. And, I have been intrigued by the very simple recipes these ladies share. The latest newsletter featured a zucchini soup recipe that was actually submitted by a reader. It included zucchini, onion, chicken bouillon, and enough water (and seasonings) to cover all ingredients. I had a large zucchini on the counter and a tub of small potatoes that needed to be used. So I decided to use both to ensure a creamier soup that would be as tasty as the Baked Potato Soup here on gfe. However, this potato-based soup recipe would be dairy free as well. I was headed to work, so after completing the initial steps, I decided to throw everything in the slow cooker and let this soup slowly “develop.” The result is this savory Easy Slow Cooker Potato-Zucchini Soup that comforts me and makes my taste buds happy. Peel and dice potatoes and add to slow cooker. Add olive oil to large skillet. Heat to medium-high temperature. While skillet is heating, chop onions and quarter and slice zucchini thinly. Add to skillet. Stir occasionally. Add garlic about halfway through cooking. When onions are translucent and zucchini is also showing some translucency, transfer mixture to the slow cooker. Stir in curry powder, sea salt, and pepper. Cook 6 – 8 hours on low. About 30 minutes before the end of the cooking time, use your immersion blender in one area for about 15 seconds. Stir. Check appearance and taste. If you want a thicker soup, use immersion blender again. Cook additional 30 minutes. Serve. Enjoy alone or with a nice gluten-free “bread” treat on the side---like popovers, corn muffins, cheese muffins, garlic cheese biscuits, or my Paleo Bread. If you have family members who are die-hard carnivores and must have meat, feel free to add some crumbled bacon or diced chicken towards the end of the cooking time. You could even add bacon, chicken, etc. to individual's bowls (per their personal preferences) and stir until heated through. I don't recommend using low-sodium broth in this recipe. This recipe makes a lot, so feel free to halve the ingredients, use a regular 4-qt slow cooker, and reduce the cooking time. If you’d prefer to cook it on the stove, I’d still recommend slow cooking at a lower heat. I do love a pot of soup simmering on the stove! Dr. Ford hails from New Zealand. 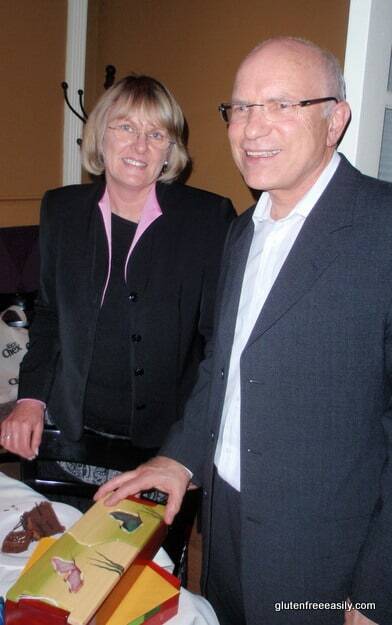 He traveled with his wife, Chris, to the U.S. to do a number of speaking engagements in November 2009. I was extremely fortunate to hear him speak twice during one week and even got to have dinner with him and his wife prior to these events. A huge group of us (some who belong to the Gluten Intolerance Group (GIG) of Richmond and others who are part of The Richmond Health Initiative) gathered at the local PF Chang’s to welcome Dr. and Mrs. Ford. Some attendees had met Dr. Ford previously when had visited the U.S. for a conference. I was already a fan of Dr. Ford before I met him—from his articles on celiac.com and his numerous down-to-earth, and often humorous, YouTube videos. I was fortunate to sit sort of across from him during our dinner and we chatted a bit . Almost immediately, he asked for my Twitter name and “followed me” on the spot. That was unexpected … and pretty neat! Over the next two days, his presentations (one to the medical professionals and the other to GIG members and guests) were superior … riveting, actually. I like seeing Dr. Ford get visibility because I think that he can make a “believer” out of just about anyone. He has the medical chops for one thing—he’s a pediatrician with a background in allergies, gastroenterology, and nutrition. Dr. Ford shared case studies—with “before” and “after” photos—of children he’s treated who did not test positive for celiac using the gold standard diagnosis of positive blood testing and positive biopsy, but were transformed on a gluten-free diet. Those innocent faces make extremely compelling cases. It’s important to note that early in his practice, Dr. Ford followed the conventional wisdom and did not place his pediatric patients on a gluten-free diet when they tested negative for celiac. However, he found that many over time did finally test positive for celiac, but, sadly, for some, the damage that had been done (e.g., short stature, developmental delays) could not always be undone. Currently, Dr. Ford’s main push is for a gluten-free planet. That was his topic when he spoke at the GIG conference banquet in Minneapolis this summer (a presentation that was very well received!) and that’s the focus of his new Facebook page, Gluten-Free Planet. My good friend, Heidi (Adventures of a Gluten-Free Mom), just happened to share a post on Dr. Ford’s mission yesterday. I told her we must have unknowingly done the Vulcan mind meld thing. She doesn’t have a husband who is a Star Trek fan, so she didn’t get the reference, but being free-spirited and positive Heidi, she eagerly bought into the idea anyway! Heidi shares her thoughts on Dr. Ford and his concept, as well as the Gluten-Free Planet YouTube videos. These videos include some of the photos showing the transformation of his patients after going gluten free. Pictures are worth a million words in these cases. Check it all out over at Heidi’s. Incidentally, I just found out that Dr. Ford has a new blog. Check it out here. His current post asks what we want in our world. Hmmm, I think the answer for us gluten-free folks is obvious. Is it possible to have a Gluten-Free Planet? I’d like to think so, and as the saying goes, Dream Big! That looks so rich and creamy. I need to get a slow cooker! Looks good Shirley. Have fun at the IFBC! This soup looks yummy! I’m not gluten free myself, but I always check your site because your food looks healthy and delicious. This soup sounds like a great way to use up the zucchini in my refrigerator. Soup is good in any weather! Hi Betty–It’s so nice to see you 🙂 and thanks so very much for your kind words! You make such a good point … you don’t have to be gluten free to enjoy these types of recipes. 😉 I do love soup all year long, but am not prone to make a big pot of it like I am when the weather turns. And, Mr. GFE is not a big fan of soup during the summer, so we compromise. there are daily direct flights from Seattle to Calgary……. H.Peter–Ah, you gotta admire someone with dogged persistence! (We are very much alike that way!) It’s nice to feel wanted. 🙂 I told Mr. GFE about your suggestion, but he says whenever I come to Calgary again he has to be with me, so he won’t miss out on any of the fun. Plus, he wants to go back to Banff and some of your other wilderness areas. Fall is my favorite time of year too. And we’re having a cold and rainy week so I jumped the gun and made my first soup tonight in a long time – it was so satisfying! I loved Dr. Ford’s presentation too — so glad to have met him. And have a super time on your trip. That will be so much fun hanging out with the gf bloggers!! Yes, I’m glad we had that road trip to hear Dr. Ford at the GIG meeting. I love his Gluten-Free Planet concept! This sounds so comforting! I too am ready for the move to Fall. I love Fall’s harvest and I love soups. It’s so easy to look in the fridge and have a delicious soup 20 minutes later. We love putting curry powder in our soups! Thanks for sharing, and for telling us more about Dr. Ford! Have a great time at IFBC. Hi Maggie–I couldn’t agree more on Fall, harvest, and the ease of making good soup. 🙂 I admit that I’ve been slow to “warm” to curry powder, but just a tad in this recipe was just right! Thanks for the IFBC wishes! Tomorrow is the big meet-up day for the gf bloggers. So many of us will be meeting for the first time, and others getting another visit with each other. 😉 Very cool! So apparently, not only do I not get out much, I have no clue about pop culture either, LOL! I knew about the weather forecast and still didn’t pack enough warm clothes … they take up so much darned room in one’s carry-on, you know? LOL … looking good, but cold! Tomorrow is our big meet-up day!! I’m totally with you on being ready for fall, especially after the hot summer we had. Fall is my favorite time of year too. Your soup looks great. With potatoes and zucchini, I’m sure my family would like it. Thanks re: soup. I was very pleasantly surprised with how it turned out. For so few ingredients and being naturally gf/df, it is a true winner! 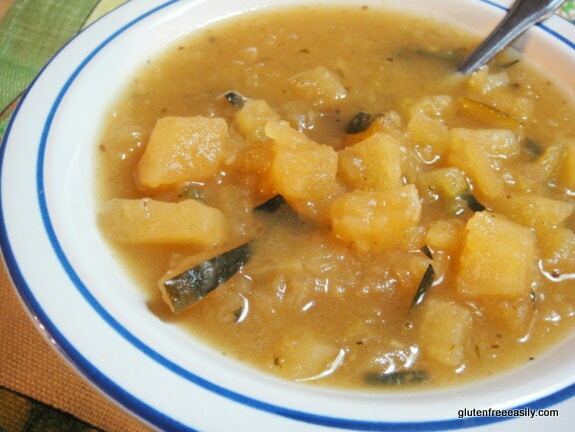 I was wondering the same thing Iris was about the richness of the soup – it looks totally delicious and comforting. Have a fabulous weekend at IFBC! I can’t wait to hear all about it. What a lovely soup! I too am ready for the change to fall. I love soups, and my freezer will be FULL of them in a month or two! thanks for your insight, Shirley!! Oh what a great idea to use up all the zucs we have! Hi Cathy– 🙂 Very easy way to use some zucchini. I’ll look forward to your version if you share over at Noble Pig. Thanks for stopping by! I know you are super busy with Noble Pig Wine these days … so very exciting! Just stopping by to tell you that of course this soup looks DIVINE! I am going to try it once it cools down a bit. It sounds like it would be hearty and filling and my kids are big soup eaters so my plan is to start collecting my recipes now! I love making soups, then freezing the leftovers for quick re-heats in the winter. One of my favorite go-to meals during the cool months. I just had the most amazing amazing time with you this weekend. You just made me feel so comfortable from the very beginning and I am so grateful for your friendship! Thank you for your kindness, your support, and for being such a leader in our gf world! Hi Kim–Once the weather cools off, I can’t get enough of soups and stews. I see this recipe morphing into many more. 😉 I’ve never frozen smaller portions of soup before, but look forward to it this year. I do love soup for breakfast or lunch at work. I made this last night — added turmeric and also kale (the last hour of cooking). And I didn’t saute the zucchini or onion (was pressed for time in the AM). Turned out great!! Hi Jennifer–Thanks so much for reporting back! I love your variation. Kale is such a great idea. I just got some wonderful kale, homegrown by a friend. 🙂 Next time if I slow cook the soup again, I will skip the sauteeing—thank you! As always, I am “catching up” on my blog reading. I wonder if people are curious as to why I comment a month or two late, sometimes? Anyway, I love the simple soup recipe. I am totally in love with my slow cooker. I got a 6 qt. one on sale at Costco for next to nothing, and I use it all the time. But, I am completely confused about this hot weather thing you all speak of. We have had a record cold summer here this year. Usually, it is in the 90s the whole time. ALL summer, we have been lucky if we hit 75 for an hour or two during the day. Stays about 65-70. Except the last two week. Still 70s except two days each week, it was over 100. (Wish I knew the emoticon for confused.) So, I have been running my slow cooker all winter, I mean summer. I really like the sound of this recipe. I think I might have to actually buy a zucchini to make it. Just got a bunch of tomatoes in my CSA box today. No zucchini. Tia–Catching up is fine … I do it all the time. 🙂 Yippee for slow cooking and bargain slow cookers! LOL on the weather … yes, I’ve heard you’ve had an unusually cool summer. We never seem to get quite the weather we want, do we? 😉 Yep, you’ve definitely had non-stop slow cooker weather. I bet you could adapt this recipe with just about anything you had on hand. Jennifer R. commented that she added turmeric and kale (last hour). I liked the zucchini, but I am always game for creating new soup variations!